Designed and manufactured by Mistral, the Outdoor Mega Combi Plus CODMC6 is a floor-standing oil boiler that’s available as a condensing or non-condensing unit. 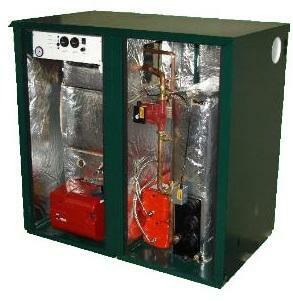 This is a highly efficient unit, shown by its efficiency rating of 90%, making it an A rated boiler. An output rating of 50-58kW makes this unit powerful enough to meet high heating and hot water demands. The features of the boiler include the integral 230V electric immersion heater, an immersion heater which helps provide a backup supply of domestic hot water in the unlikely event of the boiler failing and a frost stat which protects your boiler during the winter. In addition to all of this, it’s supplied with a complete multi-directional flue, pre-punched pipe entry points on the back and both sides for a quick and easy installation and a lockable cabinet door which means that services can be completed without the need to access the residential area of the property. Mistral have backed this boiler with a 2 year warranty on parts as well as a 5 year warranty on the heat exchanger to give you the peace of mind that this is a reliable unit.